Sadiq Khan yesterday launched five new ‘clean air’ zones for buses in a bid to clean up some of London’s worst polluted hotspots. 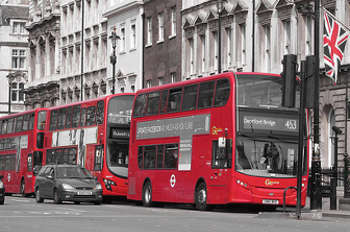 Only buses that meet the cleanest emission standards will operate within the new Low Emission Bus Zones, the mayor said. In London over 400 schools are estimated to be in areas exceeding the legal air quality limits. Air pollution contributes to around 40,000 deaths each year in the UK and costs the economy an estimated £22bn. The annual bus NOx emissions will be reduced by an average of 90 per cent along the seven Low Emission Bus Zones that have been delivered so far. Mayor Khan has committed to delivering 12 zones by next year. ‘Pollution from vehicles including buses are responsible for over half the harmful emissions we breathe,’ Mayor Khan said. ‘These zones are part of my wider plan to transform the air we breathe, including the introduction of the world’s first Ultra Low Emission Zone in central London in just under five months’ time in April 2019,’ he continued.